Comm Eye Health Vol. 19 No. 59 2006 pp 44-45. Published online 01 September 2006. 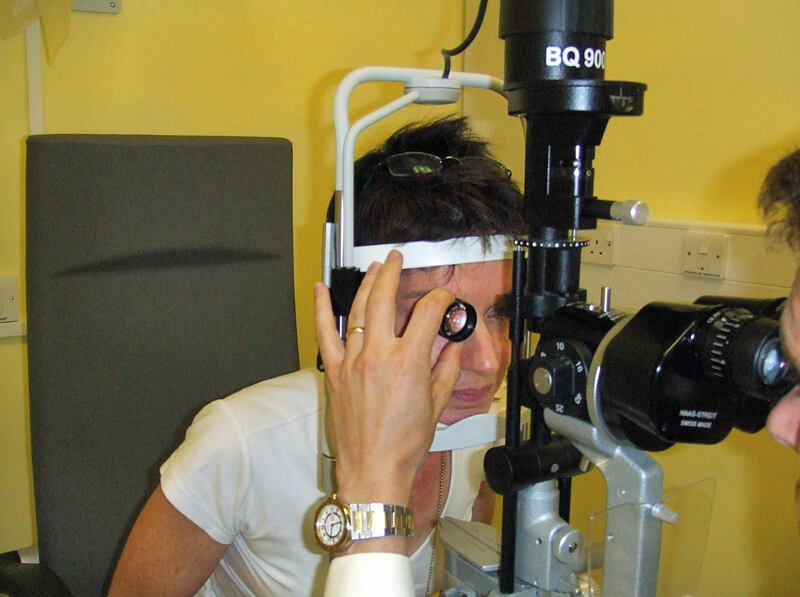 Consultant Ophthalmic Surgeon specialising in glaucoma, Glaucoma Service, Department of Ophthalmology, Hinchingbrooke Hospital, Hinchingbrooke Park, Huntingdon, Cambs PE29 6NT, UK. 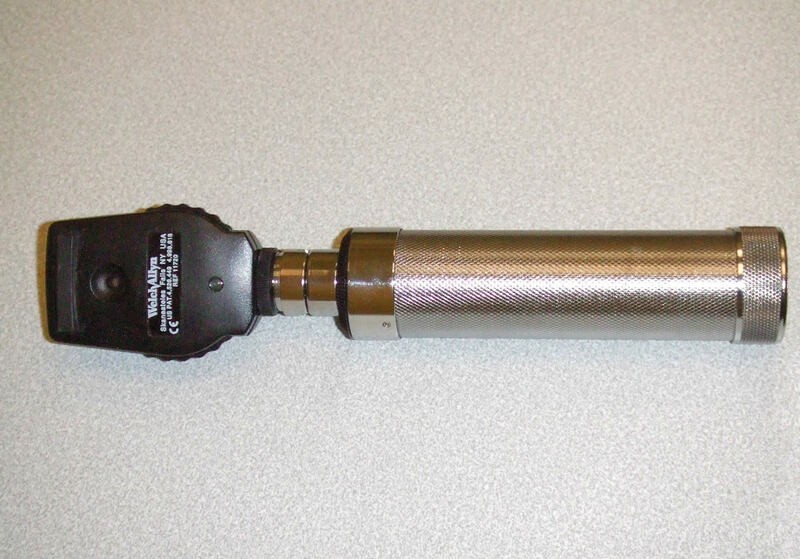 The ONH can be examined using a direct ophthalmoscope, an indirect ophthalmoscope, or using a posterior pole lens with a slit lamp. Many types of health professionals can assess the ONH accurately if they have appropriate training. The time available to view the ONH is often short as the examination is uncomfortable for the patient, so it is essential that the examiner has a strategy in mind to answer some key observations. Dilating the pupil facilitates and improves the accuracy of the examination with all instruments. 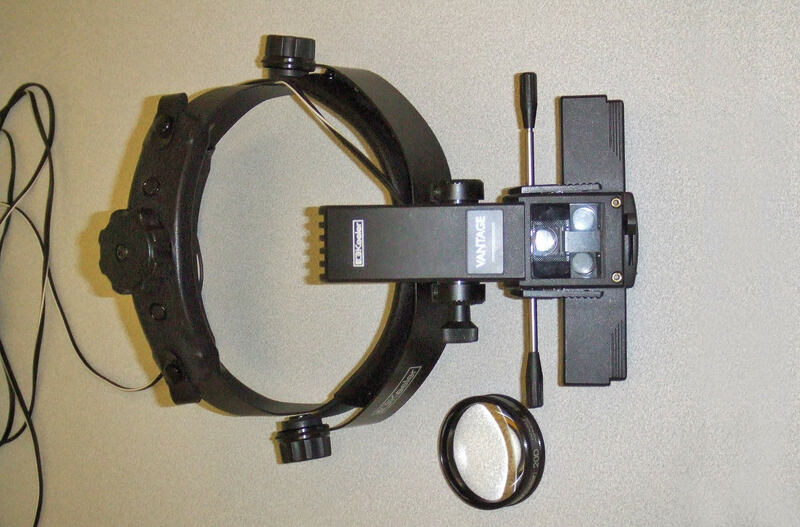 More sophisticated devices such as scanning laser polarimetry, confocal scanning laser ophthalmoscopy, and ocular coherence tomography can also be used to complement the clinical examination of the optic disc and provide quantitative measurements. The ONH or optic disc is a round/oval ‘plug-hole’, down which more than a million nerve fibres descend through a sieve-like sheet known as the lamina cribrosa. These fibres are then bundled together behind the eye as the optic nerve which continues towards the brain. 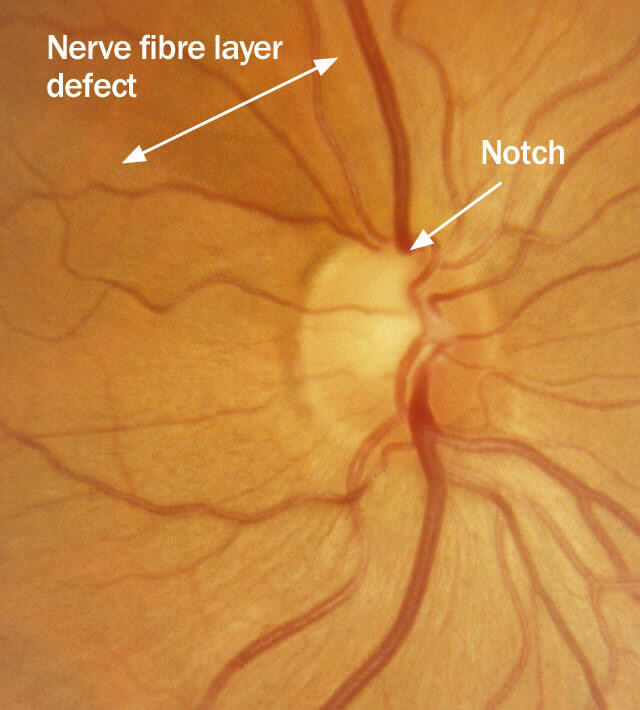 The retinal nerve fibres are spread unevenly across the surface of the retina in a thin layer which has a ‘feathery’ appearance, best seen immediately above and below the disc. As the nerve fibres converge on the edge of the disc they pour over the scleral ring (which marks the edge of the disc) and then down its inner surface. This dense packing of nerve fibres just inside the scleral ring is visualised as the neuroretinal rim. The cup is the area central to the neuroretinal rim. 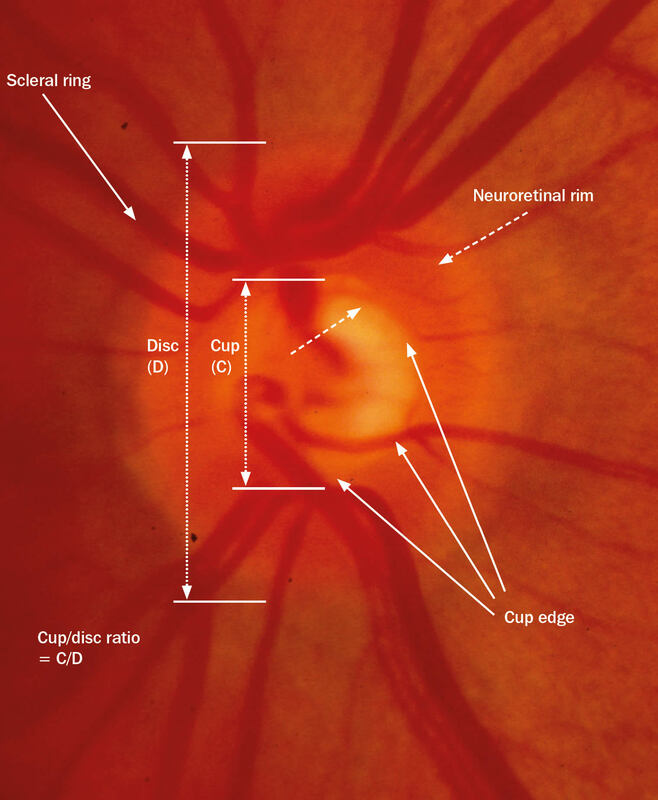 The cup edge (where it meets the neuroretinal rim) is best seen by the bend in small and medium-sized blood vessels as they descend into the cup. The inferior rim is usually thicker than the superior rim, which is thicker than the nasal rim, and the temporal rim is the thinnest (this is known as the ‘ISNT’ rule). parapapillary atrophy (more common in glaucomatous eyes). Learn the features of a normal and a glaucomatous ONH (above). Dilate pupils, if possible and safe to do so. Identify disc edge and cup edge thereby identifying rim. Does the rim thickness obey the ISNT rule? Draw an annotated diagram of the ONH. Is the glaucomatous optic neuropathy getting worse/progressing? The appearance of any of the features of a glaucomatous ONH, or the exacerbation of these features compared to a previous record, is indicative of a progression/worsening of the disease. Disc haemorrhages may be present for two weeks to three months and are an important prognostic sign of progression. An accurate record requires careful observation and a detailed drawing, at the very least. Photographic documentation (preferably stereophotography) is highly recommended. Other imaging devices offer progression analyses, but these are not a surrogate for a detailed clinical examination. Progressive worsening of the visual fields should correlate with structural changes at the ONH. 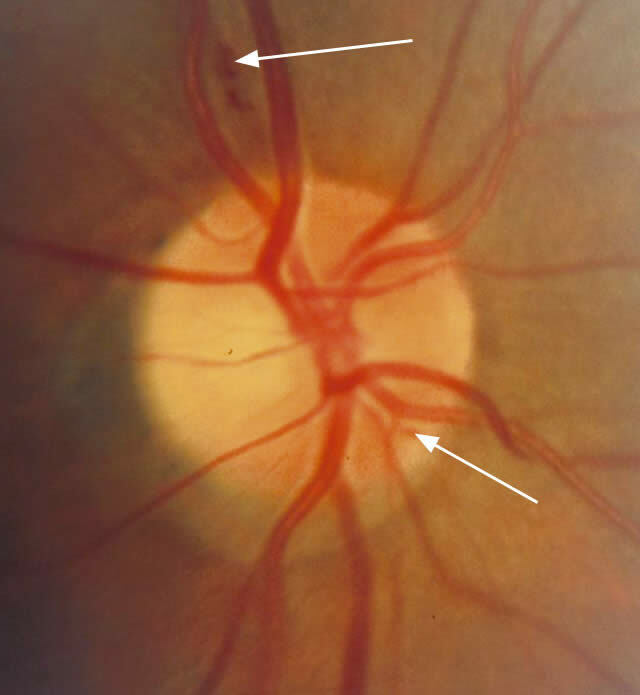 The hallmark of glaucomatous optic neuropathy is excavation of the neuroretinal rim. Advanced glaucomatous ONH can result in a pale optic disc but disc pallor should raise a suspicion of another cause such as optic atrophy. A colour difference should not be used to distinguish the cup edge; change in direction of the blood vessels is a more reliable indicator. The optic disc abnormality should correlate with the visual field defect. Where this is not the case, further investigations (e.g., CT/MRI scan) may be indicated. The size of the cup always appears smaller when viewed monoscopically than in stereo. A measurement of cup/disc ratio (CDR) alone is insufficient and may be misleading as small discs will have smaller cups and hence a smaller CDR. 1 Fingeret M, Medeiros FA, Susanna R Jr, Weinreb RN. 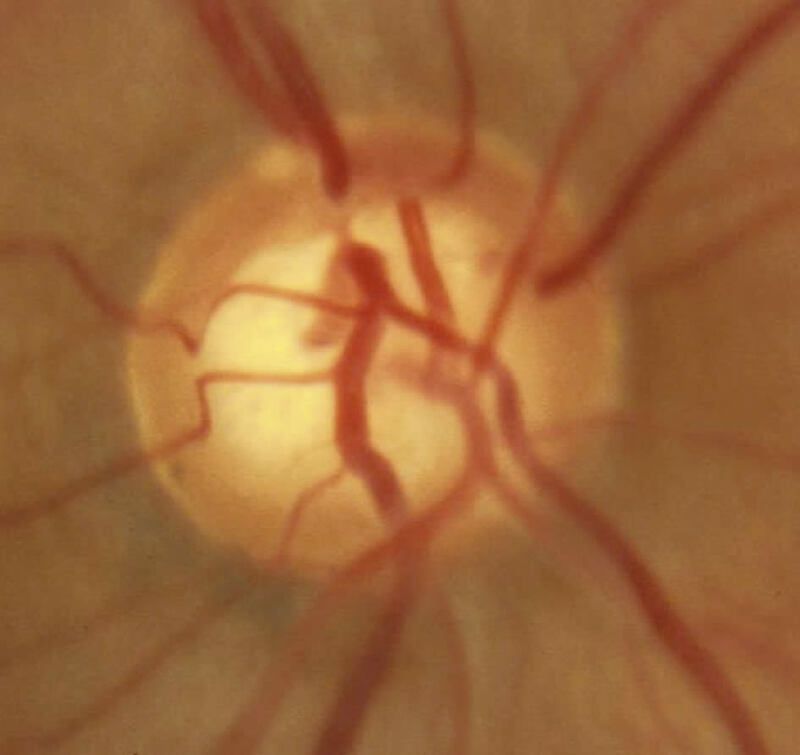 Five rules to evaluate the optic disc and retinal nerve fibre layer for glaucoma. Optometry. 2005 Nov;76(11): 661-8. 2 Lester M, Garway-Heath D, Lemij H. Optic Nerve Head and Retinal Nerve Fibre Analysis. European Glaucoma Society 2005.